I've never been the hugest fan of oatmeal; I find it too gummy and thick, and never to my liking. 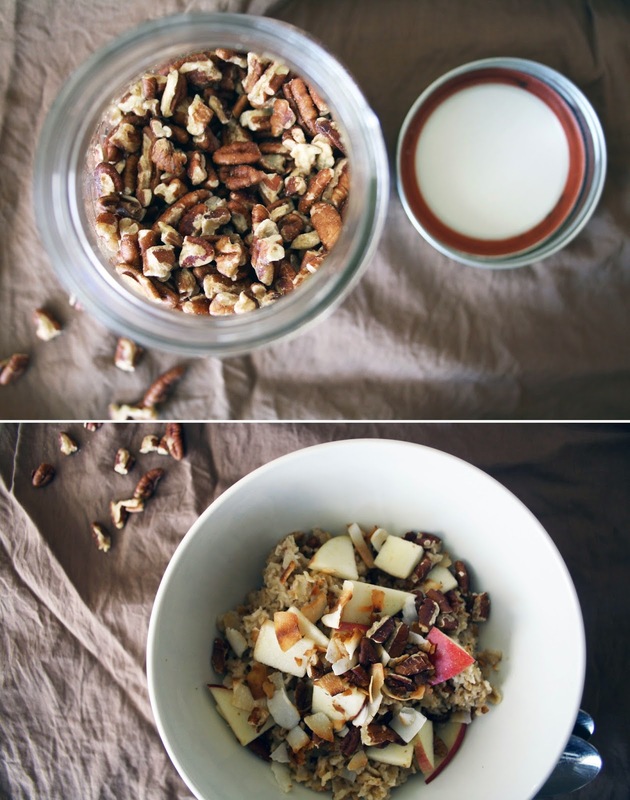 This recipe on the other hand, is the most perfect way of cooking oats. It takes a bit more time then throwing a bowl of quick oats in the microwave, but trust me, it is SO WORTH IT! Since buying Whole Grain Mornings, I've made this oatmeal a few times, always topping it with something different: toasted hazelnuts, pumpkin seeds, sesame seeds, pomegranate, whatever I have lying around really. This morning's combination was definitely a winner - lightly toasted pecans and coconut flakes, chopped apple and a drizzle of maple syrup - perfect for a leisurely long weekend Monday morning. Oats adapted from Whole Grain Morning's "The Very Best Oatmeal"
Start by toasting the oats. Over medium heat, melt the coconut oil in a large skillet. Add the oats, and toast until fragrant - about 5-7 minutes. Stir occasionally and watch closely, once they start to brown, they'll go quickly. Combine the milk, water and cinnamon in a large measuring cup. Once the oats are ready, pour the liquid into the pot, stir, and bring to a slow boil over medium heat. Once boiling, turn off the heat, and cover. Let the pot sit on the burner for 7-8 minutes. Do not peak, do not stir. After 7 minutes, check the oats - if they're still too watery, put the lid back on, and let sit for a few more minutes. Serve into two bowls and top with desired topping. Note: These oats keep well for about a week in the fridge. Simply reheat in the microwave, with a bit of extra milk, as needed.